Nintendo has long been the leading light in the platforming genre, a part of that legacy being the focus of Super Mario Anniversary celebrations this year. 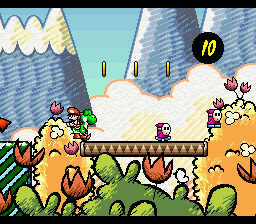 It's a genre with plenty of scope for variety, however, which is something Nintendo pushed forward with the superb Super Mario World 2: Yoshi's Island on Super NES, placing Mario's sidekick(s) at the core of the adventure with a different approach. Flutter jumping, eating and egg throwing brought a more sedate, puzzle-based approach to running and jumping. Of course, Kirby was another early innovator in platforming, and was the first of Nintendo's heroes to be turned into yarn by Good-Feel, purveyors of cuteness and clever design. 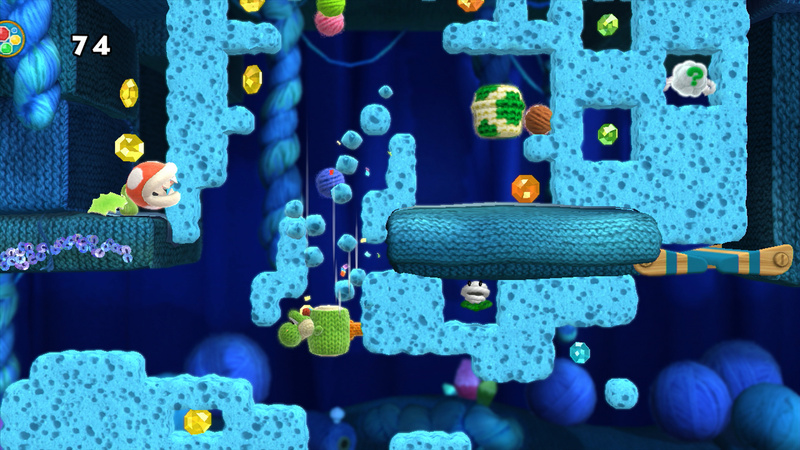 Kirby's Epic Yarn on Wii was a stand-out, and the same core treatment has been applied to Yoshi's Woolly World, with an improved HD engine and a fresh approach. 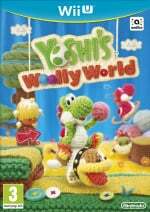 Unlike Kirby's adventure in which the pink one was bolted into what was originally to be a new IP, Yoshi feels like he belongs in this bouncy, soft world; it's a natural fit. As for storyline, those that would rather not look after Baby Mario should breathe easy, as that mechanic is nowhere to be found here. The plot revolves around a fabric-based world with Kamek appearing and effectively stealing the population of woollen Yoshis, bundling them up into Yarn. Your hero naturally goes in pursuit across a fairly standard stretch of worlds and levels, but it's a cute setup to charm older players and make younger players smile. Upon setting off with Yoshi, Epic Yarn fans will immediately notice that Good-Feel has ramped up the tempo to suit our boot-wearing mascot. A quick build-up of speed sees your feet transform into wheels, and while the general action is a little slower than a 2D Mario title, it's well ahead of Kirby's Epic Yarn. In various senses the core design ideas are similar or the same as its Yarn-based predecessor, but this infusion of pace is welcome. Even Yoshi's jump is more rapid, eschewing the floaty leap of Kirby yet introducing the delightfully frantic flutter jump - for fans of logical (and we use the term loosely) game physics this makes sense, as there's a lightness to Yoshi that suits his woollen construction. 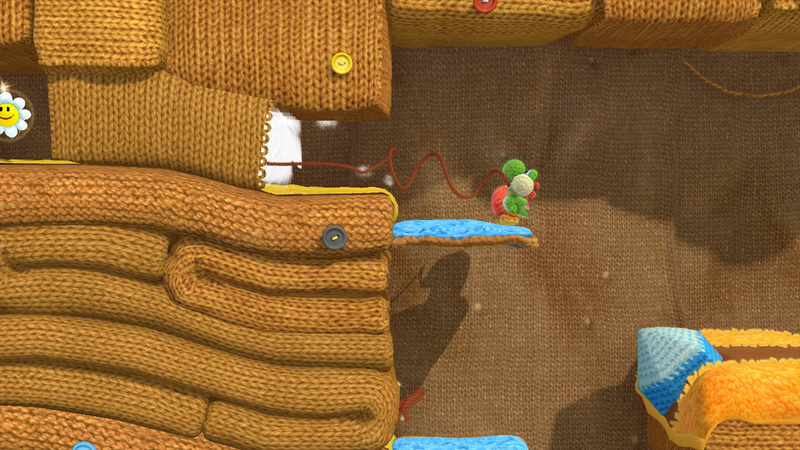 Within the woollen world most of Yoshi's core mechanics remain in place. You can eat enemies and either spit them out or swallow them into woollen balls, the latter of which can then be thrown; as per tradition you can use a quick aim in which the reticule moves in a 180 degree arc, or you can pause for your shot. There is a Wii Remote control option that supports tilting as a means of aiming, but even so the relative complexity of Yoshi's move-set will be a challenge to some familiar with the simple grab and throw of Kirby's Epic Yarn. Such is the nature of early levels and unlimited lives, however, that any player can take the time to master the controls. For veterans, of course, these controls are a breeze, and the happy news is that Woolly World not only puts Yoshi's abilities to the test, but it also makes for some clever design. Question mark clouds are deviously hidden, and you need to always be on the lookout for loose threads on which to pull or suspicious sections that may be hidden areas. The challenge in Woolly World comes not from simply beating a stage, but completing each requirement of collectibles or proof of skill - you need to end each level with full health, collect all Miiverse stamps (which are hidden within gems), grab five flowers and also five balls of yarn. You may grab them all first time in the earliest levels, but completionists will be drawn into repeating stages on multiple occasions as the difficulty ramps up. It's in stage design, utilising all of these factors, that Good-Feel has achieved some wonderful results. 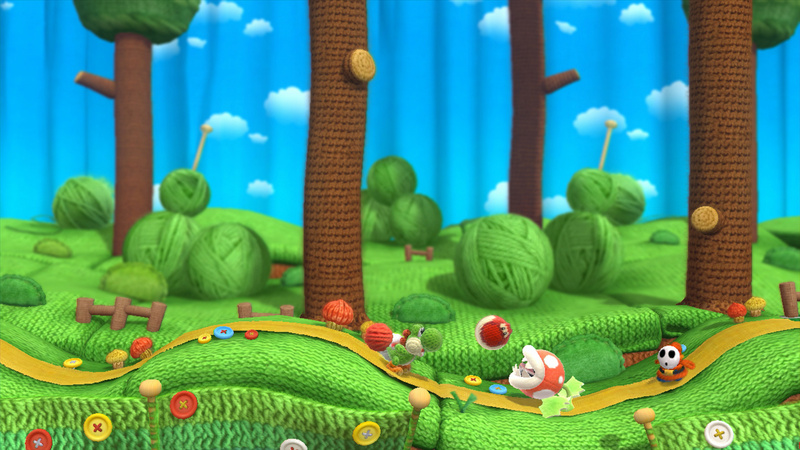 We see riffs on toys and yarn in various forms, and the logic (such as it is) quickly embeds itself into gameplay - hurling balls of wool can fill in outlined platforms, while some enemies can only be defeated by wrapping them in yarn with a projectile and following up with a stomp. You see Yoshi's nose squish into fabric when pushing a hidden wall, or you unravel a blocked path with his tongue, while there are stages that play with invisibility and much more besides. A couple of fast-paced stages even brought franchises such as Donkey Kong Country to mind, some are labyrinths and others are focused on verticality. There's some delightfully playful creativity on show. This also applies to short challenge areas in which Yoshi transforms into various creatures and items, ranging from an agile dolphin, a steady umbrella, a fast motorbike and more besides. These come in short bursts, and some can be missed entirely by inattentive players; nevertheless they provide some truly memorable moments. Two player local co-op is included, as is the norm with Nintendo platformers, and this feels like one of the stronger uses of the option. It does have an element of playful chaos as you bounce off each other, which is given a delightful malleability due to the woollen effect, but it's also hugely practical for taking on tougher stages or reaching tricky collectibles. This is due to the fact that you can swallow and turn each other into eggs / wool balls, and therefore use the other player as a projectile weapon, carry them through tricky sections or simply hurl them onto an out-of-reach platform. While we believe all collectibles are there to be claimed in single player, co-op is a simple, fun way to reach areas through team work. That could be useful if a skilful player wants to help out a rookie, then, and the Mellow mode is another option. Switchable from Classic mode at any point - even mid-level - this gives Yoshi the ability to fly at will, replacing the frantic flutter jump with a gentle flight. It also slows down the aiming reticule, too, so it's a useful tool. With progress in the game you also unlock a wide range of Power Badges, with abilities that vary from drawing items to you magnetically, to calling in cute assist character Poochy, making you invincible to fire and more. Though you accumulate plenty of gems in the game, these badges are nevertheless relatively pricey within the in-game economy, and despite the odd freebie the sense is that they're a backup to help you through tough stages or, perhaps, when trying to hunt down elusive flowers. Some of the Power Badges absolutely become necessary when hunting collectibles. As we mentioned above, completionists will be kept very busy, and as per the Nintendo tradition collecting also unlocks special levels - these come from grabbing all the flowers in each of the six respective worlds. These extra stages are particularly tough, controller throwing tests, pushing capabilities and stripping away reassuring checkpoints. Unlocking and beating these could add a lot of playtime, while grabbing all five balls of Yarn in each level unlocks a neat Yoshi design. More Yoshi designs, some of the best in fact, come through amiibo. Practically all amiibo are supported, even those that seem inconceivable at first - want a Shulk-based Yoshi? No problem. Bowser, or Toad? All included, even the Splatoon inkling. Collecting and playing with different Yoshi designs is certainly enhanced by amiibo. As for the dedicated Yarn Yoshi, we didn't have one for review but it's been shown how this essentially drops in as a clone Yoshi in single player, which makes some aspects of co-op - such as throwing another player to inaccessible areas - possible while playing alone. These are neat extra features utilising the figures, and a little more inclusive and charming than some throwaway ideas we've seen in other games. As for playtime, Yoshi's Woolly World is pretty generous for a platformer. In an era when many of us want more bang for our buck, Yoshi's Woolly World delivers - rushing through the campaign should take most at least 8-10 hours, but will likely take much longer with co-op sessions and the aforementioned collect-a-thon. Though the basic level count - excluding extra stages - is 48, these can often be lengthy levels full of puzzles and exploration. There are some quicker levels, but some will genuinely stump you at points, and the use of yarn in puzzles that are based on colours or quirky mechanics keep things fresh. As per the Yoshi tradition - especially the classic SNES entry - you go at a slower, more deliberate pace from start to finish than others such as Mario; mad dashes are the exception, not the rule. 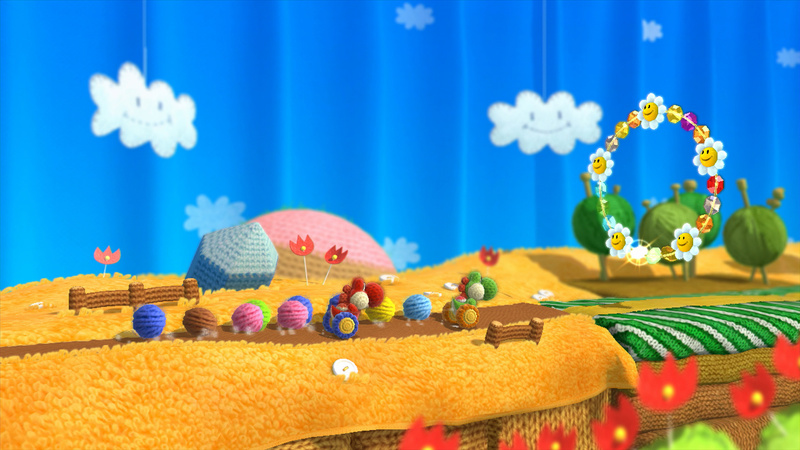 Of course, with Kirby's Epic Yarn being quite a looker on Wii, thoughts also turn to the visuals of Yoshi's Woolly World. That's a simple judgement from our perspective - it looks gorgeous. 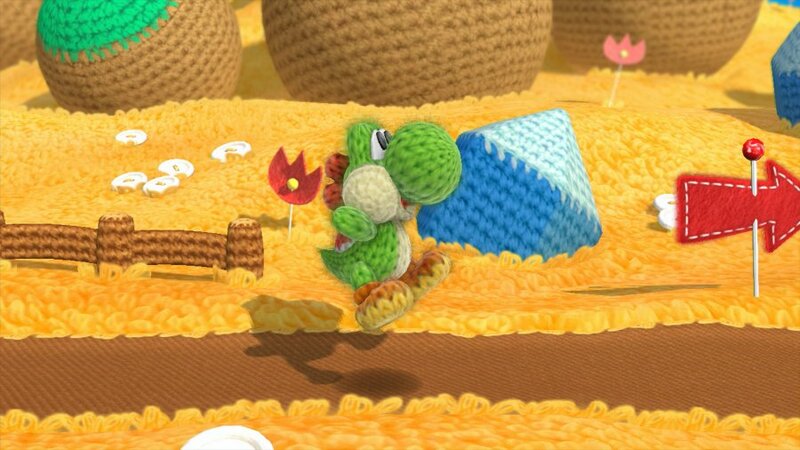 There's lovely detail in seeing threads of yarn, environments deliver welcome variety, and there are clever animations and touches that play into Yoshi's ability to transform; Good-Feel shows terrific attention-to-detail and care. The framerate clicks along at a solid 60fps for the most part, too, though we saw a smidge of slowdown in a few moments. Sound is also excellent with some catchy music, though we did notice some tracks appearing a little more regularly than expected. 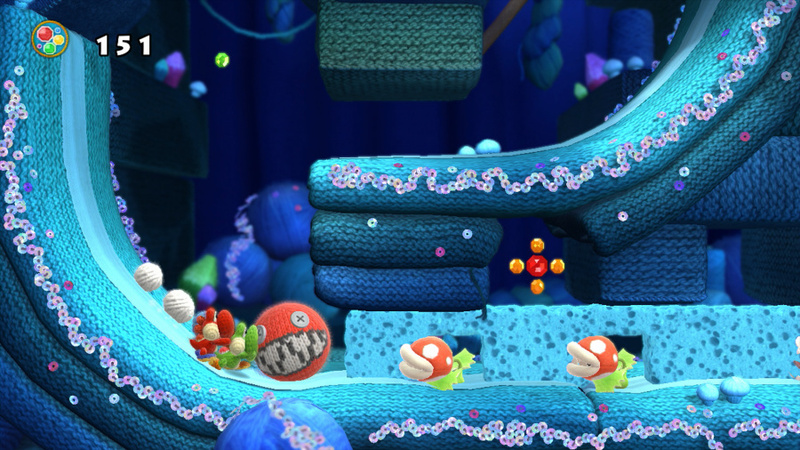 Yoshi's Woolly World has very few weak spots, though they should be acknowledged. Boss fights, while a visual spectacle, are slightly hit and miss in design and difficulty, with a couple of strong examples let down by repeats or the occasional sense of niggling disappointment. The slow, methodical nature of some stages also makes some of the checkpoints a little too far apart, with moments where you'll be repeating slightly fiddly puzzles before facing a dreaded tricky section. These are rare and relatively minor complaints that do little to detract from the brilliance of the overall product, but deprive it of pure platforming perfection. 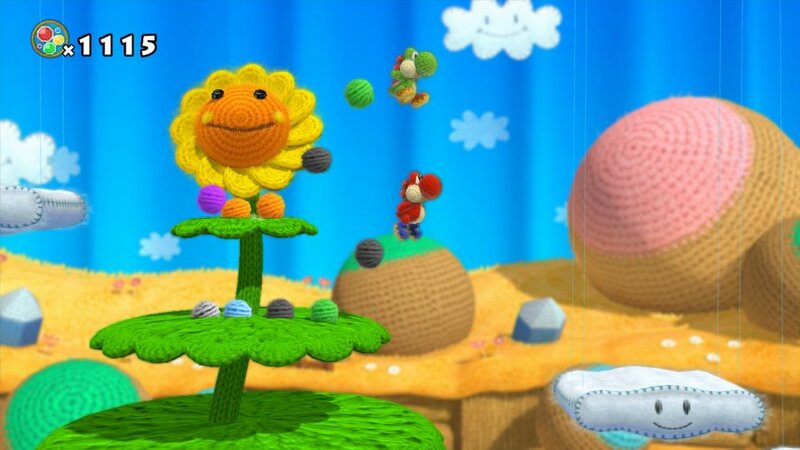 Yoshi's Woolly World has been a long time coming, but it's been absolutely worth the wait. It's accomplished platforming within Yoshi's quirky and unique template, and has enough soft cuteness to charm young gamers and melt the hearts of the most jaded of veteran gamers. Along with some of Nintendo's best co-op platforming, tough collectible challenges for skilled players and some simple but neat use of amiibo, it also delivers where it matters the most with clever, witty stage design. This stands up as one of the Wii U's elite games - perfect for snuggled in gaming time. BUT THA WII YOOU IZZ DEAAD! Seriously, though. This is awesome! I thought this game will get an 8 or something! Awesome! Day 1 for me! Man, I can't wait for this game. Definitely the game I'm most looking forward to, outside of Super Mario Maker. A 9? The cuteness should at least make this an 11, no less! This is a relief after the last few Yoshi games. I've pre-ordered already but only because I really wanted a wooly amiibo! Only thing missing from the game is Blimp Yoshi! I want a Blimp Yoshi amiibo, and of course all these amiibo too. I don't care how awesome Wii Fit Yoshi would be I'm not taking WFT out of her box. Good Feel is an outstanding developer, that's 3 home runs in a row now. WarioLand Shake It was terrific and Kirby's Epic Yarn was a fun game despite it being very easy to beat and a great option for co-op with less skilled players. And after reading that I'm definitely picking this up. Why must I wait until October!!!!! Is this coming out somewhere soon? Thought NA didn't get it for awhile. All I want to know is if it's got the feel of the first Yoshi's Island. Or is it just a super casual platformer. Living in NA, I'm so jealous of you all, haha, but nonetheless, enjoy! I am slogging through Yoshi's new island (got it free so cant complain too much), and am relieved to hear this doesn't have the baby Mario mechanic. Was expecting an 8/10 so 9/10 is a nice bonus. Thanks GoodFeel for proving that Artoon/Arzest has been the problem, not Yoshi. Also nice to see the sheer variety of amiibo supported. I was a bit on fence but it seems like this will be a day one purchase. 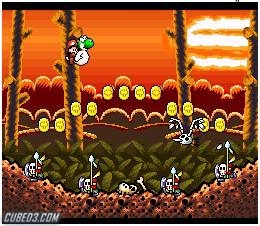 I loved Yoshi's Island as a kid but later games haven't been as great. The lowest price I could find was 45€ so getting it from eShop for 40€ + getting a free DS game is just what I needed. This review was the final thing I needed to make sure I won't be disappointed with my purchase. Kamek should be in Smash Bros. Does this game make you aware of the things you need to get to 100%? Or is it something like Triple Deluxe where it doesn't show you all the items that you've collected in the game. My only gripe with Triple Deluxe was that it never showed the rare keychains that you found in every level so I had to replay the same levels over and over again. Its gonna be tough, I have the limited edition with the woolly amiibo on order for a friend, whist I'm getting the standard one to avoid the USK logo; plus I want to call it quits on amiibos. Bit it all looks so cuddly!!! I just don't know whether to buy now or wait till next month as I've already spent a fair bit this month. Super hyped for this, day 1 download on friday for me, been my most wanted game this year followed closely by metal gear 5. I feel I should dial down the hype though as I feel yoshis island snes will not be beaten anytime soon. glad its reviewed well. On a side note, hope the nx is region free as the US wait for this seems ridiculous. And mean..
Great review Thomas,thoroughly enjoyed reading that.I had no doubts this was going to be a classic and this review confirms that.Soon as it's on the Eshop this beauty is mine. Woo!!! So excited for this. My wife and I enjoy Nintendo co-op platformers, and this looks fantastic. I was hoping this would review well. Still not sure about picking this up at launch, but I might keep my eye on it for Christmas. @OldWeeDog I don't. America gets everything else earlier. Too bad the game is way too easy. I'm not someone who feels the need to collect everything in a game, getting the challenge just for collecting unneccessary items/collectables isn't what I want from my games. I'll be waiting for a price drop. @Late You get a free DS game if you buy it from the Eshop? It's not for me, but it's good to know that it's a quality game. Can't wait to see this game on a HD-screen. Next week can't come soon enough. Started to wonder why there was a review for an October game but now remember NA gets this like 4 months after everyone else. Thanks Obama. So this is the real deal huh? Not too easy like Kirby's Epic Yarn, not a touchscreen game like Kirby's Rainbow curse, not too difficult like DCKTF? This already sounds like my favorite 2D platforming game of all time. I much prefer taking it slow and exploring every little nook and cranny and finding secret areas than the hit-or-miss trial and error rhythmic gameplay of some 2D plaformers. And it sounds pretty long as well. At my speed it will last me 20 hours playing w/ my wife. I guess that's why US is getting it late, Nintendo has a game I really want Day 1 and they're withholding it from me. Sorry everyone. One thing I would like to have seen mentioned in the review is Gamepad usage. I don't think the word Gamepad is in there once, that's pretty hard to do for a Wii U review. Even if it has no use like in DCKTF usually the reviewer mentions that. Can player 1 or 2 use mellow mode while the other uses classic, or do both people have to play in the same game mode? Can player 2 use the Wii U Pro rather than the Wiimote? We're not big fans of sideways Wiimote usage in my house. Does silver Mario amiibo make a sliver Yoshi? I can't find a single thing silver Mario does in any game to differentiate him. I've read gold Mario turns something gold in MP10. Note to Nintendo - I'll pay $40 for an HD remaster of Subspace Emissary redone in that engine. Well maybe w/o the wool. Or maybe some worlds wool, some clay, some paper, some cell shaded. Make a sequel w/ online multiplayer and I'll pay $60. People are dieing for Kingdom Hearts 3, people love mash-ups and crossovers. I don't wanna wait until October! Now show us Shulk Yoshi!!!! @rjejr So, that's why we have to wait until October. I really don't get it, though. I'm missing something. I don't see what this game is conflicting with or why it would be better later. Oh, well. Europe win at the Ryder Cup. We also win at Yoshi. YUSH. @aaronsullivan I can imagine the real reason why you have to wait longer has probably something to do with the yarn yoshi amiibo and their on-going sock issues. Would that sock be made of yarn? I had forgotten about that, though, and you are probably right. @VeeFlamesNL because an 8 is terrible right? I can tell when I want a game or not by how I react to the review. If I'm not interested I scroll straight to the score as I did with this. For games I want I savor every last word like it was my final meal. But seeing a 9 and knowing my kids tastes.....I may have to consider this for an xmas present. Guess I need to read the whole review now. I'm ok with Europe getting this 3 months early....they deserve to see an early release sometimes. I'm in Canada so I don't get this yet, but I'm so pleased this got a good review, and that it has good difficulty. I'll be getting this come October! My wife and son would love this game. I've already played and beat Epic Yarn and loved the soundtrack. Can't wait to see this one! 7.4 sounds low compared to this 9. Did they say it had "too much wool"? I don't get it why this releases much later in NOA. Is it because of that silly amiibo? "As for storyline, those that would rather not look after Baby Mario should breath easy, as that mechanic is nowhere to be found here." Should be breathe*, not breath. "The framerate clicks along at a solid 60fps for the most part, too, though we saw a smidge of slowdown in a few moments"
I'm not entirely sure how y'all do reviews here on Nintendolife, but can you confirm 60fps based on capturing and analyzing footage yourself, or are you just taking Nintendo's word for it? Not meaning that to be snarky, just genuinely interested. @sinalefa There were two complaints. I only remember one which is " very few good levels"
Aww yeah good to see this is a game worth getting. I'm not usually a yoshi fan but I have been smacked by the cute. Will pick up in October! ...October is shaping up to be REALLY expensive this year for me. Ah well new toys! most other review have been pretty negative, that's disappointing, oh well, still looking forward to it. @sinalefa Ha, it sounded like he (IGN reviewer) mostly didn't like the collect-a-thon aspect. I've been waiting for this game for a long time. A 9 is a great score, but I'm hoping it'll be a 10 in my book. @rjejr Too difficult? The difficulty in Tropical Freeze is perfect! @TheAceofMystery I put little stock in anything IGN says. Every time I visit that site I get the feeling the whole thing is run by corporate suits who have little personal interest in games. What's interesting is that Nintendo hasn't released a retail Wii U game yet this year that has gotten over an 8 by IGN. Kirby, Mario Party, Splatoon, and Yoshi all got below an 8 on IGN. Not bad scores, per se, but gaming companies want that 9 or above. That's why the review scale's interpretation has become so skewed over the years - something between a 7 and an 8 is considered "barely passed" like on a test that isn't graded on a curve. Shame that the review scale's interpretation has become that way. That's why I usually look for user reviews, or just buy whatever interests me. Cant wait to pick this up Friday😃 Sorry Americans 😔 I guess it makes up for all our waiting down the years,But Nintendo global release dates should be a thing for all games. September is gonna be long, but glad it turned out well. THIS is the the kind of Yoshi game we want instead of that New mess on the 3DS. Game looks great (And overwhelmingly cute) though, can't wait to pick it up later this year! @aaronsullivan - "I don't see what this game is conflicting with"
Are you really trying to make sense of the Ninteod release schedule? 1. Summer of Spaltoon!! While I agree if we did get Yoshi soon,then it wuldn' thave to be the summer of Splatoon, but I think Ntinedo wants those Spaltoon servers full of US gamers so we can get into 4v4 player matches quickly. The less players the longer it takes, the more the buzz dies down, so no Yoshi divrsion for us. 2. What else do we have for the holiday? I know Oct 16 is a tad bit early to be seen as a holiday game, but Ntieod's likes that monthly flow (ooh that sounded bad) so Sept 11 SMM, Oct 16 Yoshi, Dec 4 XCX, Fatal Frame Oct/Nov(not intetested so I forget), Devil's third, and Starfox Dec. And out of all those games only Yoshi is really a family friendly holiday game. 3. Yarn Yoshi amiibo stock. That poor woman in the ND can only knit them so fast. OK, bad jokes aside, it gives them more time to make the yarn yoshi. Can you think of any better stockign stuffer in the whole world than a yarn Yoshi? I can't, not even in the history of stocking stuffers. So anyway, between those 3 I have to give them the benefit of the doubt. Actually to me the real question is - why release such an obvious Christmas game in June anywhere else? This game looks really great, but I don't think I can deal with the super slow paced music. 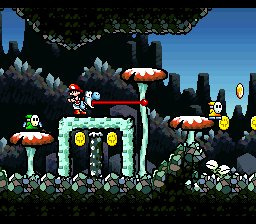 I always loved the upbeat feel of the first Yoshi's Island. Maybe if there was a "Higher Tempo Music" DLC pack I could give it a shot. I can already tell this will be a very high contender for me as GOTY. Perhaps even a contender for best game ever for me, personally. This game looks so beautiful and cute, and it looks like an absolute blast to play as well. Aside from that it also has some of the best use of amiibo thus far, if you ask me, and I can't wait to get my hands on this game on Friday. This is the game that Yoshi deserves after all these long years. The only really worthwhile Yoshi platforming game aside from the original (and the GBA remake) is the DS entry, and it's nice to see Yoshi getting such a wonderful treatment once again. Thank you, Good-Feel, for delivering such a charming Yoshi game and redeeming Yoshi's glory after the abomination that was Yoshi's New IslandNew Island! You make the Yoshi fan in me feel-good! ...now my only concern is actually getting my hands on those precious Yarn Yoshi amiibo. If this is $60, I think I'll wait on a sale or B2G1 deal near Christmas along with Mario Maker and XCX. @Dr_Corndog - "The difficulty in Tropical Freeze is perfect!" I'm more of a invincible god mode gamer these days, losing doesn't work well w/ my short fuse disposition. I'm all about the scenery and stopping to smell the roses. @Zach777 Yes - a fellow transmission from NA over here - I don't know why we have to wait - couldn't they give us Kirby's Epic Yarn on the eShop to hold us over?? @Sanicranfast It's a bit more UK-centric. But seeing as sales numbers show about 1,000 UK people own a 3DS and about 100 people own a WiiU, they still do lots of US news because like 10k of us bought a 3DS and 200 people bought a WiiU! Wait, this game is out??? It's coming this week, can't wait. Opinion: Which is the cutest game for Wii U, Captain Toad, Kirby and the Rainbow Curse, or Yoshi's Wooly World? Well not much choice but to wait four months until this is localized to English for us in North America I suppose. Great. Just great. Have to wait until October to play. Guess I need to buy Splatoon pretty soon. @OorWullie: It was mentioned in the latest weekly download news. If you buy Yoshi's Woolly World from eShop, you'll get Yoshi Touch & Go for free (limited time offer). Man, I really want to give this a go but that wait for we US'ers is long. You guys in the UK are lucky to be able to play this so soon. @Mommar Not really. That's one game when we were forced to wait 3 months for the Kirby Wii U title. Or the year we had to wait for the Persona 4 fighting game. Yes, we get nice perks in special editions and the basic new3DS model, but one game shouldn't make the EU situation enviable. I almost feel obliged to buy this since us Europeans are lucky enough to get such an early release, and the review only makes me want it more. I'll have to see if I can find the bundle with the amiibo available anywhere at a reasonable price. Are the Pokemon amiibo compatible? @rjejr I may end up the same way when I have kids, but I hope not. @ThomasBW84 I have to echo what @rjejr asked, Can one person play on Mellow mode while the other plays regularly? Not that it's a deciding factor for me, but I've been curious about that since its reveal. @Samuel-Flutter I'll check that out for you. So does tapping a Smash or Mario-series Yoshi Amiibo do the same as the yarn-Yoshi-amiibos? Exactly the quality I had expected. @Sanicranfast I was only talking about this one game. And now the North American fans get to wait another 4 months -_- Seriously, why do we gotta wait so long? We get to play Super Mario Maker before this Great review, just makes me hate the wait even more, though. @ThomasBW84 Thanks Thomas! Also does the Regular Yoshi amiibo give you a plastic Yoshi to use or is it just another Yarn Yoshi? What a stitch up, I heard it's knot that good, with knit controls and a wooly script. I don't know why they couldn't release the game in July for NA. October is far away. Ugh. Very good review! I saw some other very positive reviews so i'm definately going to get this one. @Samuel-Flutter - 2 player mellow mode's not a deciding factor for me either, I have a little bit of dignity left. Very little, but some. Man if I can't play Yoshi, it's time to hang it up. Can't wait to play it. exactly my kind of game. Looks like they've pulled off a mixture of great gameplay, intelligent level design and charming aesthetics... just what comes to mind when the Yoshi games are mentioned (or at least when the SNES classic is mentioned). This one feels like it's not only for Yoshi fans; but for anyone who wants to play a great platforming game, or, to put it simply, for anyone who wants to play a great game. @Deanster101 - It's only really IGN and Gamespot that have come down hard on it. I hardly find their opinions credible anymore. Oh and the Metro... A lot of other outlets have given this around an 8/10 - which is just about where it's sitting on Metacritic. I think most people already knew whether or not they were interested in this one. Another Nintendo mixed review score game. A good 9/10 here, but only 60% from others. Another 'long game if you collect everything' but only 8/10 hours otherwise. What I would like to know....is it possible to collect everything in single player mode without having to use an Amiibo? Otherwise its just an 8 hour game. Welp that settles it, I am definitely getting this game! I thought it looked great to begin with and this only serves to confirm that. This could very well be the best platformer on the Wii U! They were developed by different companies; Yoshi's New Island was made by Arzest, Woolly World was made by Good-Feel. Don't worry. Like Stubborn_Monkey said, it's from Good-Feel. And they made a great job with Epic Yarn. @shinynewbicycles I didn't even mention Gamespot myself since I find them even less worthwhile than IGN. As one of the older game sites on the internet, they seem to me these days to mostly be a relic trying futilely to make themselves relevant. Although it has no real bearing on the overall quality of their review, I find it very appropriate that the quotation chosen on Metacritic for their review of Yoshi's Woolly World includes an egregious misuse of the word "paradoxically." Seems like you're one of the highest scoring reviews; so I'll take this with a slight pinch of salt. The game def looks good but just a few little things give me pause. Still; it looks pretty solid and fun. Awesome, I'm pretty sure I'm going to love this, and I'm lucky enough to be able to play it later this week! Usually I prefer my platformers' challenge to come from getting to the end of the level rather than collecting stuff but I feel like the slower pace and absolutely gorgeous surroundings will make me enjoy collecting stuff in this game a lot more than I usually do. Hyped. I couldn't be more excited about this game. Looks perfect to me. I just hate having to wait until October for a finished game. This looks nice, but it looks a bit easy and slow for my liking. I'm glad to hear that there's lots of hidden items to collect, since I like spending lots of time searching each nook and cranny for every last item. If there wasn't too many other games I really wanted to play, then I might have picked this up. "The difficulty in DKC Tropical Freeze is perfect!" You know I've always been one for the hard-core platformers, but I can appreciate a game like this as well. Kirby's Epic Yarn? No. That's a little too soft for my liking. But this one? I can definitely dig it. It seems like they ramped up the difficulty to a medium challenge right on par with your average Mario game. 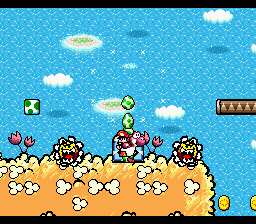 SMW2 Yoshi's Island wasn't "perfect". I'd say it was very good, but not perfect. If we compare other Yoshi's Island games, yes it is perfect. Can't wait to get my blue yarn Yoshi and this game on Friday!! Great to hear! My wife loved Kirby Yarn and she will love this game too. It is fun to play with her on games like this. Can someone confirm if Shulk Yoshi even exists in this game? I really want to see one. I hope it kinda looks like Shulk Kirby with a little Monado on his back. Why does the UK get this early? There is no language barrier between the UK and US so there isn't many things that need to be translated. What gives Nintendo. @Chaoz I agree with you but I bet you guys get Super Mario Maker months before we do, I think it's crazy UK/ Europe gets it on Friday and America and Canada have to wait four months. And no I'm not taking the p**s.
@Chaoz Release schedule positioning. NoA wants to load up the fall/holiday season. That's actually traditional - until the past few years, the summer was always rather bare for console games in NA due to sales always being higher in the fall/holiday season. I hate to wait until October, but EU had to wait even longer than us to play Shovel Knight, so it's only fair. Xmas in the UK, at least, is all about guns in your stockings, we don't get them in real life here so they just go all festive with COD through the holiday. My partner is a teacher at a primary school and she asked why a kid was so tired (6/7 year old), asked if was staying up late, the dad's response was 'well sometimes they watch me play call of duty, do you think that's a problem?'. Yoshi's got nothing on an Uzi. @Kirk a lot of Nintendo games have been like this recently, not living up to past glories. Specifically the New Super Mario series when compared to Mario Bros 3 and World but also 3d World when comparing to the Galaxy games and Mario64. Most independent sites are suggesting this doesn't hit the heights of Yoshis Island, largely due to the lack of the Mario babies who whilst could be annoying the game wouldn't have been the same without them. Nice review and nice score. I'll pick it up this week! @AshFoxX - Don't forget Shin Megami Tensei IV, and was only released on the eShop. @PinkSpider - And currently 6 is the lowest score on Metacritic. After the ridiculous review gamespot did of DKCTF there credibility is at an all time low. @BlueBlurIxM Interesting regarding the palette swap. I remember getting it after 100% completion but I guess that was just how I finished the game. Still; it's an awesome little bonus in and of itself, and you do def get an extended ending for 100% completion, which is a nice little extra reward for all your hard work, and I think if Yoshi's Island had that too then it basically would have been perfect imo. I mean do you have any examples of games that you would say are by comparison more perfect or closer to perfection? I know I have a bunch of games that I consider near perfect game designs and game experiences (especially for their time but mostly even now imo; if you can see beyond the graphical/technical limitations in some cases), Tetris GB, Super Mario World, Yoshi's Island, Fantasy Zone II Master System, Street Fighter II Turbo, F-Zero SNES, Mother 3, Advance Wars, Sega Rally Championship, Super Mario Bros 3, Super Mario All-Stars + Super Mario World, GoldenEye, Playstation Doom, Halo: CE Xbox, Counter-Strike PC 1.5–1.6, Journey, etc., but maybe you have a very different idea of "perfection", or more precisely, near perfection, than I do. @carlos82 Exactly. I still think that pretty much the SNES era was where Nintendo near perfected all its best franchises and it's never been quite able to reach that same level of near perfection with most of those games/franchises since. Some of its games have come close but imo the SNES version of pretty much every classic Nintendo franchise is about the best it's ever gotten. I'm still looking for Nintendo to reach those levels on a regular basis again; that pinnacle as it were. If it did manage that I don't think it would have a problem selling its consoles to any of those "lapsed" Nintendo gamers; that's for sure. Multiplayer.it gave it a 9. And "La granda bellezza" (The great beauty) became "La grande morbidezza" (The great softness). Like I said. It is VERY good. And at the time it was a perfect game. But now you see flaws you haven't seen back then, if you are not looking to it with nostalgia. - Repetitive soundtrack, level design and a little the look of the game bother me. It is more of the nitpicky stuff. Actually not noteworthy, because the game is very good. But when I mean perfect, it means "perfect" as in 100%. There has to yet to come a game that I call perfect.. And that will never happen. There will be always things you won't like. Nobody is perfect; even games. @BlueBlurIxM Well basically nothing in this world is ever going to be literally perfect; so when we are talking about perfect in terms of video games we're both obviously talking about that level of 'near perfection' in terms of all-round design and execution—in a way that is realistically possible for any video game to even conceivably reach—well at least I am. I personally would absolutely disagree in terms of the level design and the look of Yoshi's Island. I think the level design is generally sublime and bordering on genius for the most part. I mean it's platforming level design of the highest order imo, with lots of creativity, scope for exploration, discovery, platforming challenge and lots of secrets and collectibles to discover through experimentation. There's never any blind jumps, overly difficult to reach areas, messy looking visual layouts, far too small or far too large chunks/sections that leave you unsatisfied or frustrated, or unfair deaths, etc.. The art style is just brilliant and gorgeous. It still looks stunning even today, and considering the game is 20 years old, I think that it testament to just how good and timeless it is. The pixel art only adds to the 'artistic' look of it imo. Overall it matches brilliantly with the story/theme and general sentiment and feel of the game too—it actually enhances it. That's some gorgeous artistry going on there. I don't recall the soundtrack being repetitive in the slightest but I'm going to go onto YouTube right now and check out the game's soundtrack just to see where you are coming from on that one. I can tell you this immediately though: I never once noticed it being repetitive or getting annoying when I originally played it and completed it 100% back in the day. I do remember the music being really catchy and very high quality in general though. Edit: I'm not really hearing where you are coming from regarding the soundtrack. It seems generally really strong to me, with a bunch of great little tunes, lots of variety, and is really fitting to the game: https://www.youtube.com/watch?v=oRxgYC5zrV4 Altough maybe the same tunes play countless times throughout the game, but like I said, I never ever noticed this being an issue when I played it before and it's never been apparent when I've played it recently either. That the same tunes play countless times throughout the game bothers me a lot. I'm a person that notice that instantly. And then bothers me throughout the game. I love when a game has a wide variety of differently soundtracks; like DKC: Tropical Freeze. I said pretty much everything I had to say. So..
btw. How did you edit your post without the text formatting all over the place? Or did you just delete your original post and copy pasted it again with the "edited" text? @BlueBlurIxM I've never really noticed any post losing its formatting just by editing it; so I couldn't say. It would be interesting to see if any reviews at the time pointed out the repetitive soundtrack. I certainly don't recall anyone pointing that out as issue back in the day; either professional reviewers or otherwise. Look up. I just edited my post above you. This is how it looks after I edit comments posts. Really annoying. Did I say that it bothered others? No. I just said that that it bothers me. It's my personal opinion. No more, no less. Will probably get this, love Yoshi even if that 3DS game was pretty rubbish. @BrizzoUK - COD:North Pole NSA decides Santa and his elves are a terrorist organization, sends in elite wet team to take care of the big boss man and his disciples. Venison for everyone. I hope you didn't misunderstood me. @rjejr ... It would sell. Might risk a 'too much snow' on IGN though. They'd have to make the elves 6foot tall Cyborgs with testosterone problems. @BrizzoUK - Well I assumed the elves would have Crysis like nanosuits, they are elves after all, they build the best toys. IGN would definitely say "too much snow" though, that's a given. It seems that IGN Italy is a bit wiser than its american counterpart, especially since the only game that had a lower score in Italy is the slightly disappointing (at least for me) Kirby, who received a 7.9 (instead of an 8), while Mario Party got an 8 (6.5), Splatoon an 8.2 (7.9) and Yoshi an 8.2 (7.4). The only amiibo I have is Yoshi, so I'll get a Yoshi Yoshi? On a more serious note, this looks very good and I'll probably try to get it for my birthday in August. That's not the problem. It was just not that what I was trying to say. And others that read that could misunderstand this conversation. I just don't want to look like an idiot. Is it a Super Mario Yoshi or a Smash Bros Yoshi? The first is a second "Yoshi Yoshi"; the latter is a "Yoshi Yoshi" costume. Is it different for every theme? Or it follows Yoshis New Island lazy execution? That's a better score then I was expecting. Can't complain about that. Playing it right now, as Splatoon Squid Yoshi. I can confirm its a great game and I'd personally give it an 8.5 thus far (played up to 1-5). Seems to me that many reviewers are marking the game down significantly according to personal preferences rather than quality and/or execution of the game design. It's still a bit beyond me that Woolly World is released in Europe so much earlier than the US. I mean, isn't there a lot more localisation needed for Europe? Is this a production thing, like they need to have so-and-so much physical products for the North American market? Considering that demand for Amiibo in the US and Canada accounts for ~65% of the total stock and that these Yarn Yoshis are even more desirable - I'd say its pretty likely that production is a factor. Of course they could simply be delaying to pad the release schedule. I hope they release a Yoshi's Woolly World or Super Mario Maker Wii U bundle. As for the game itself, I was one of the people who just couldn't get into Epic Yarn. I almost never say this, but it was way too easy. Good cure for insomnia though. This game however looks like it could be fun. "Seems to me that many reviewers are marking the game down significantly according to personal preferences rather than quality and/or execution of the game design." Most reviews have given up the illusion that video games are largely based on objective observations. And that's a good thing! Who doesn't love playing as yoshi? a wiiu masterpiece and must have!